Animals as simple as the jellyfish are rarely credited with complex behaviors. Gelatinous marine animals were named 'plankton' from the Greek for 'drifting' for good reason. But some plankton have evolved spectacular behaviors that help them to survive. For example, daily horizontal and vertical migrations by Mastigias in "Jellyfish Lake" (Ongeim'l Tketau, OTM). 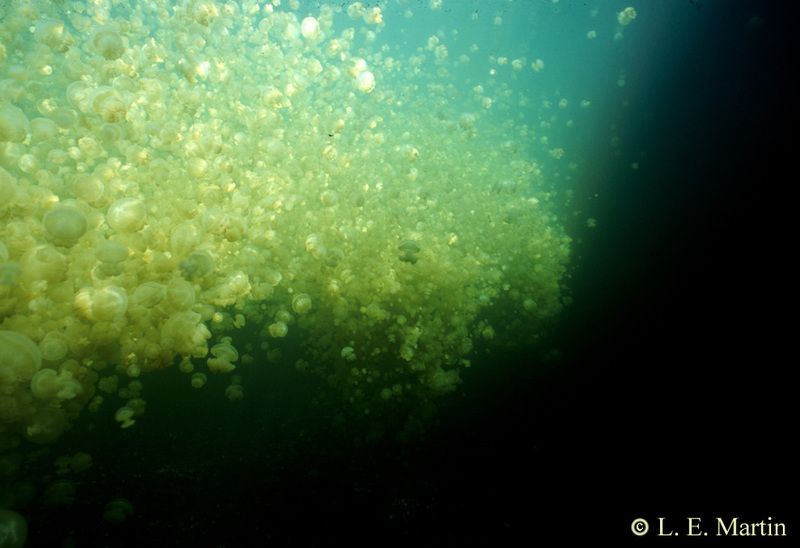 If you were to snorkel in the lake just before dawn, you would find millions of Mastigias medusae milling around the western half of the lake. The gentle, rhythmic, pulsing of their bells would be more likely send you back to sleep than to remind you of jet propulsion, which is the mechanism by which they move. They swim in all directions, change their heading often, and have no particular destination. All this changes at dawn (6 am, never much less and never much more) when, with the sky brightening in the east, the jellyfish turn and swim diligently toward the rising sun. For an hour or more they swim, never faltering, rarely turning, with incessant contractions of their bell, until they approach the eastern end of the lake. Here, although still stimulated to swim eastward by the rising sun, they are stopped, not by the edge of the lake, but by the shadows cast by overhanging trees which they meticulously avoid. The medusae become trapped between swimming east toward the sun and swimming west away from the shade. The millions of jellyfish that were once in the west are now packed densely around the illuminated eastern rim of the lake, with nowhere else to go. Nowhere else to go, that is, until the afternoon. As the day progresses, the sun passes directly overhead and then gradually begins to descend in the west, releasing the medusae from their quandary. As the sun begins to track westward, all the jellyfish accumulated in the east begin to follow the sun back across the lake, returning to where they originated in the morning. The jellyfish swim west until they encounter the shadow lines cast along the western edge of the lake as the sun descends in the west. They accumulate in the west, as they did in the east, swimming around, continually avoiding the shadows, staying in the sunlight and avoiding the shore. 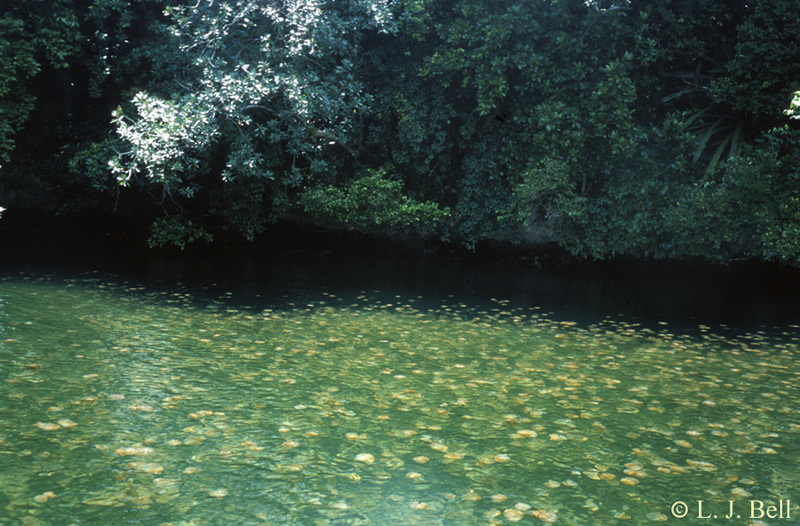 By 3 or 4 p.m., the eastern basin which became densely packed with jellyfish between 9 a.m. and 12 is again almost devoid of jellyfish as they have all returned to the western end of the lake. 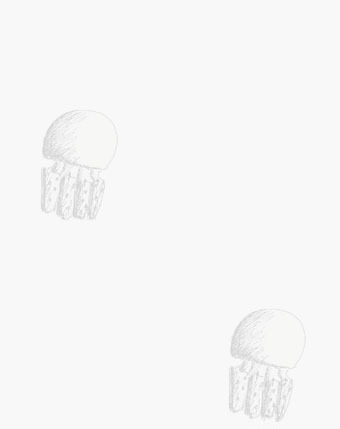 As the sun sets (very rapidly in the tropics), the shadows quickly move across the lake and the jellyfish can no longer remain in the sunlight. Now in the shadows, and lacking any directional light by which to orient their swimming in a horizontal direction, the animals begin to swim vertically, up and down in the water column, remaining more or less in the same position with respect to the shore (thus, this behavior keeps them away from the shore during the night). At this time, they may swim downward and encounter the nutrient rich boundary between the anoxic depths and the oxic upper layers where their algal symbionts absorb lots of nutrients. However, they are always moving - swimming up and down. 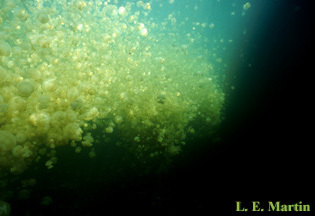 When the sun rises the next day (but before it actually illuminates the lake's surface), the jellyfish accumulate at the surface in response to the increasing light. Here, once again, they mill around until the first rays of sun entice them to the east. 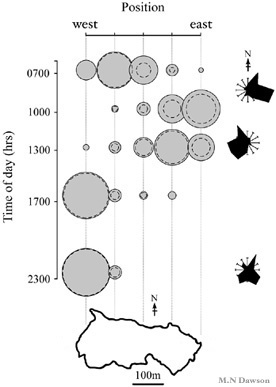 In summary, the jellyfish complete one round-trip migration from west to east and then back to the west every day between sunrise and sunset. At no point do they ever stop swimming - during the day or night. During the day, their swimming is either strongly directional as they migrateeastward (in the morning) or westward (in the afternoon)or haphazard as they mill about waiting for the sun or avoiding shadows. At night, they also swim continually, but vertically rather than horizontally as during the day. The migration is the summed result of each individual animal responding to the light cues in the same way. 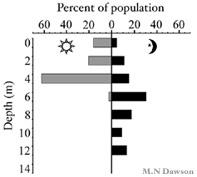 Below: Bar graph showing the vertical distribution of Mastigias. The medusae are shallower during the day (light bars) and deeper during night (dark bars).